My friend actually “requested” this post, and I loved the idea. She wanted a post on how to pack healthy food for an entire day in order to refrain from “giving up & going to the drive-thru”. Like myself, she has just begun a semester of full-time internship plus full-time night classes. So, basically, the both of us spend 8 am- 5 pm working & then head straight to our university for class from 6pm- 9pm. If that’s not a long day, I don’t know what is! Mix that with a 40 minute commute each way, & it leaves me with a serious lack of that whole “time” thing. As I’ve mentioned before, I don’t “eat out” during the week. I prefer to spend my money on fresh groceries that I can prepare myself from home. 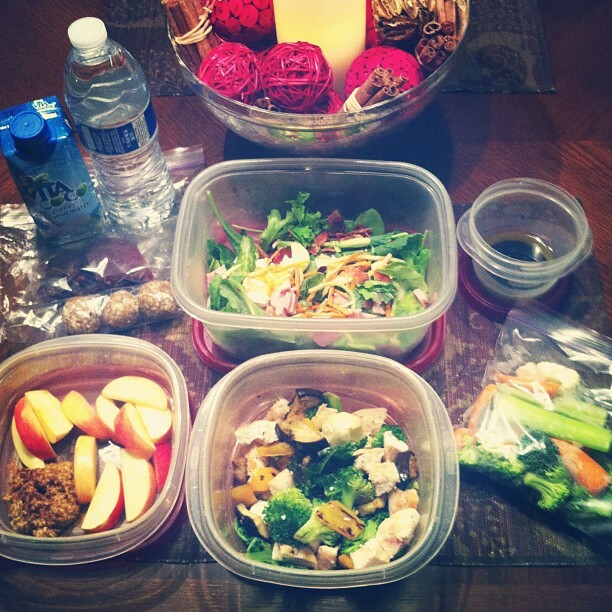 I like having control over what I will be eating throughout the day, & what ingredients will be going into my meals. I find it much easier to maintain a healthy diet (& weight!) when my food choices are made in advance, rather than “in the moment” when I’m hungry & may or may not be thinking clearly. It’s easy to go overboard on food or make a poor meal choice when you’re starving and short on time. · Fruits & Nuts: Great for snacks, but don’t overdo it! I usually go for sliced apples with almond butter, Larabars, trail mix, berries, or whatever fresh fruit I have in the fridge. o Slice up veggies like baby carrots & celery as soon as they’re home from the grocery store & keep them in the fridge. Toss in a bag with some broccoli or cauliflower for a snack. o Keep spinach or mixed greens on hand for salads. o Cherry tomatoes, cucumbers, shredded carrots, & broccoli slaw make great additions for salads as well. o Avocados are a great source of healthy fats & taste good too! Take lots of liquids & stay hydrated! That's it! Let me know if you have any questions & what you like to pack for on-the-go!